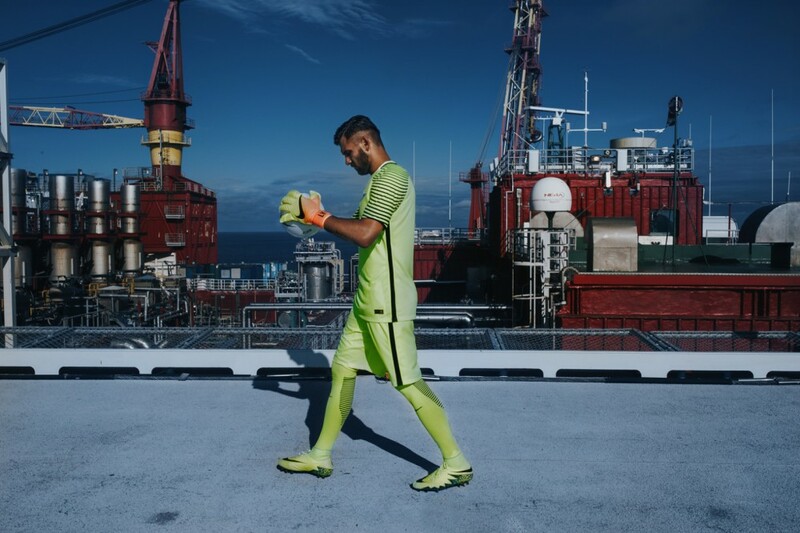 In cooperation with club sponsor Gazprom, the football players were sent by helicopter to the remote Arctic oil platform of «Prirazlomnaya» for a photo shoot. The trip was part of the club’s presentation of this season’s new kits. The Independent Barents Observer has got the permission of Zenit to republish the photos. The original photo series are available on the club’s homepage. The players were on board the «Prirazlomnaya» for only a few hours, the club informs in a press release. “It is a journey of a lifetime! […] It is a pity we didn’t come when the platform is surrounded by ice, when the walruses migrate and polar bears are here, but still it has left me with an incredible impression», says player Artem Dzyuba. “This is perhaps the most extreme thing that I have done in my life,” says Nicolas Lombaerts. “I have never been so far away from civilisation. Just preparing for the trip was intriguing, the wetsuits, the lectures on safety, explaining to us what could happen, but fortunately everything went perfectly», he adds. The new kits will be shown on the pitch for the first time on the 30th July, when Zenit plays Lokomotiv Moscow in St. Petersburg. The «Prirazlomnaya» is Russia’s first and only offshore oil platform in the Arctic. It is located in the Pechora Sea about 60 km north of the Nenets coast. The platform is operated by Gazprom Neft and production started in December 2013. Peak production of five million tons is planned for about 2020. In 2015, the platform produced about 800,000 tons of oil.